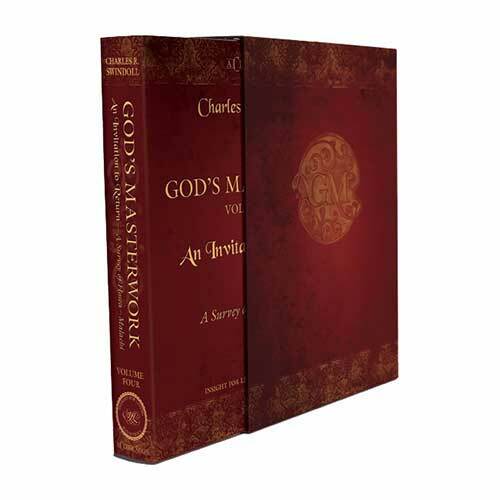 Listen to Chuck Swindoll’s overview of Haggai in his audio message from the Classic series God’s Masterwork. The prophet Haggai recorded his four messages to the Jewish people of Jerusalem in 520 BC, eighteen years after their return from exile in Babylon (538 BC). Haggai 2:3 seems to indicate that the prophet had seen Jerusalem before the destruction of the temple and the exile in 586 BC, meaning he was more than seventy years old by the time he delivered his prophecies. From these facts, the picture of Haggai begins to come into focus. He was an older man looking back on the glories of his nation, a prophet imbued with a passionate desire to see his people rise up from the ashes of exile and reclaim their rightful place as God’s light to the nations. Haggai’s prophecy came at a time when the people of Judah were extremely vulnerable. They had been humbled by their exile to Babylon, hopeful in their return to their Promised Land, and then so discouraged by opposition in their rebuilding of the temple that they had quit (Ezra 4:24). Now, sixteen years later, with Haggai blaming their lack of food, clothing, and shelter on their failure to rebuild the temple, the Jews were receptive to his message of rebuilding the Lord’s house. Unlike most of the other prophets, Haggai explicitly dated his prophecies, down to the day. He gave four separate messages, the first on August 29, 520 BC (Haggai 1:1); the second on October 17, 520 BC (2:1); and the final two on December 18, 520 BC (2:10, 20). These messages encouraged the people of Judah to finish building the temple and to have hope in God for the promise of blessings in the future. Why is Haggai so important? 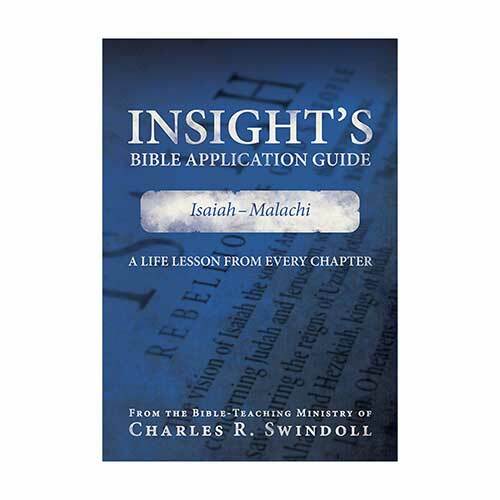 After thousands of years, the book of Haggai remains largely unique among the books of Old Testament prophets for one key reason: the people of Judah listened! 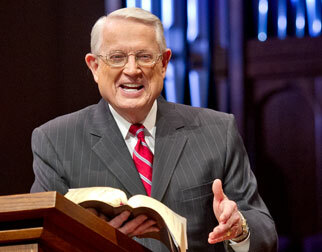 Haggai’s message to rebuild the temple was passionate, simple, and straightforward (Haggai 1:8). No one could mistake whether or not his direction had been followed—the results would be evident for all the people to see. Through the physical act of rebuilding the temple, the people began to indicate a shift in their spiritual lives: from devotion to self toward devotion to God. 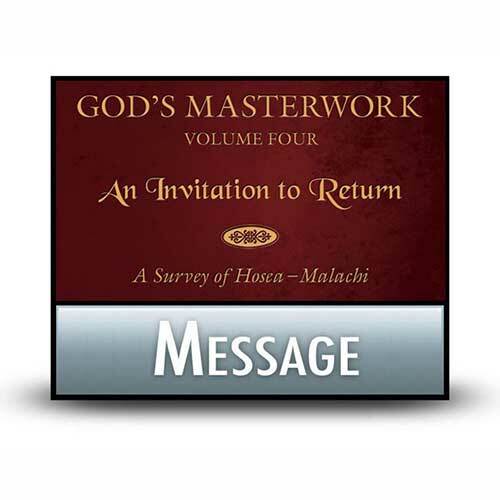 Haggai had an important message for the Jews who had recently returned from exile. They had forgotten their God, choosing instead to focus on their own interests, so it was time for them to “consider [their] ways” (Haggai 1:5, 7). Nothing was more important for the Jews than to show that the Lord was at the center of their thoughts and actions, so Haggai directed them to finish rebuilding God’s temple. However, rather than leaving them alone with the task of rebuilding, Haggai continued to preach to the Jews, encouraging them with the hope of future glory in the temple and a victory to come over the enemies of God’s people (2:7–9, 21–22). According to Haggai’s message, if the people would place God at the center of their lives, they would realize the future blessings that God had in store for His people. The Jews who emigrated from Babylon to their original homeland of Judah faced intense opposition, both external and internal. Ezra 4:1–5 records the external resistance to the project of rebuilding the temple. The enemies of Judah first attempted to infiltrate the ranks of the builders, and when that didn’t work, they resorted to scare tactics. Haggai, on the other hand, focused on the internal opposition they faced, namely from their own sin. The Jews had thoughtlessly placed their own interests before the Lord’s interests, looking after their own safety and security without giving consideration to the status of the Lord’s house. Haggai’s encouragement to rebuild the temple in the face of the Jews’ neglect brings to mind the apostle Paul’s exhortation to Christians to build our lives on the foundation of Jesus Christ (1 Corinthians 3:10–17). Are you building a life that reflects your status as a temple of the Holy Spirit, leaving a legacy that will stand the test of time? 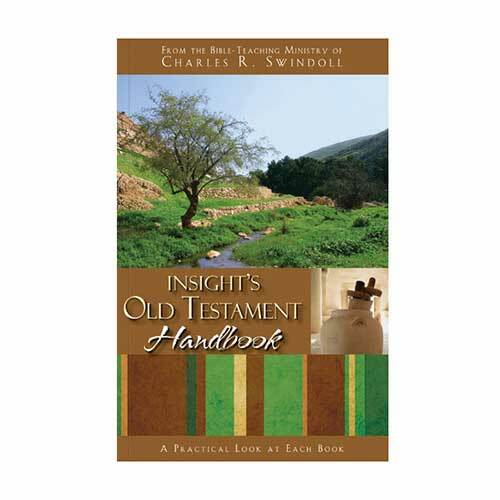 Find encouragement for that construction project in the four passionate sermons from this Old Testament prophet. 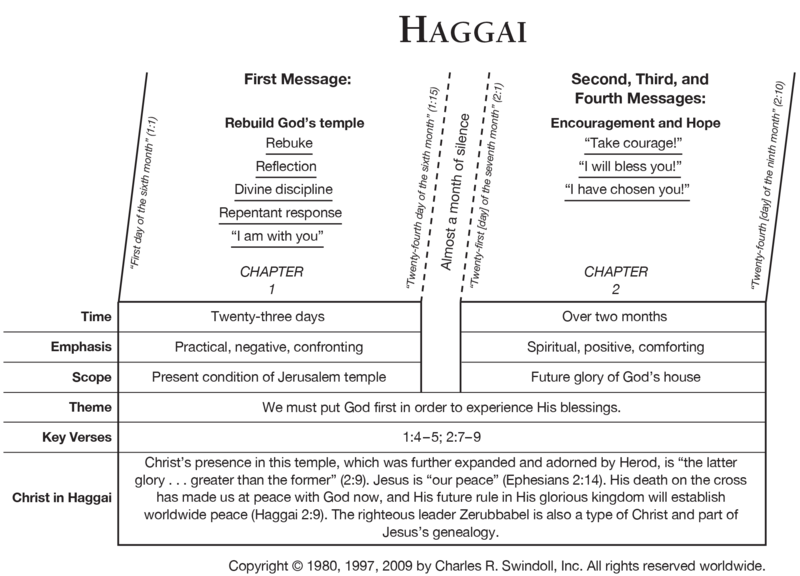 View Chuck Swindoll's chart of Haggai, which divides the book into major sections and highlights themes and key verses. 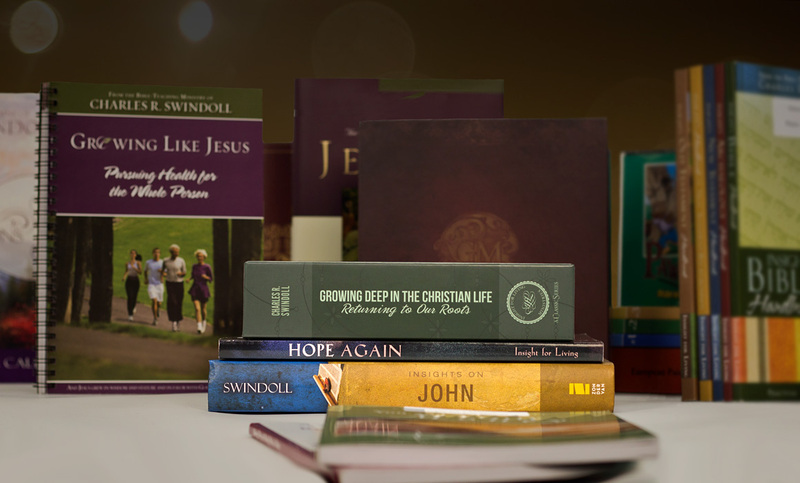 Discover more resources related to Haggai.